I used it for extension code creation. This review is about item#11123174. The extension cord of the three-phase power supply cracked, so I used it for replacement. It was short at 10 m, it was a little long, but I used 20 m. I am satisfied that I can exchange cheaper than purchasing at a neighborhood home center. If possible, if it is 5 m increments it was purchased at 15 m and so we made four stars. This review is about item#25414857. TIG welding machine of single layer 200V, semi-automatic welding machine, plasma cord cutter etc. Extension cord. You can use it with a sense of security. Although there is a thickness, it is supple and supple that it is supple and does not habit easily and cleaning up easily. This review is about item#11123192. Used as a power cable for power tool. In the case of a two-wire line (power line) it is white and black Do you think it would be nice if there is a color of white and red? This review is about item#11123183. Normally, good quality products. Naturally it is a good product. This review is about item#11123131. There is no problem, laying and using. We can not feel the weight of the cabtire cable too much. This review is about item#11123165. Power harp tap for hobby used for homebrew. 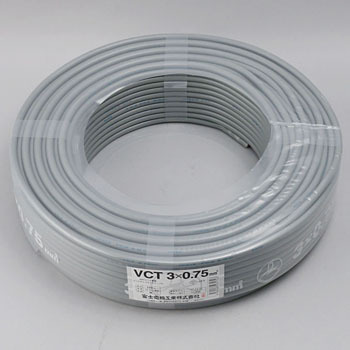 It is a popular electric wire among audio mania for a long time. It is easy to process well with careful handling. It is preeminent for audio effects. This review is about item#32587755. It is saved because there is no shop selling at a cut-out in this area, it is necessary to purchase with 1 turn. Maintenance of vacuum packaging machine, automatic packaging machine, etc. It was very helpful to get it soon. Since quality etc. are also manufacturer goods there is no problem. This review is about item#11123235. It is very handy. Cable flexibility is very easy to handle. This review is about item#32587746.